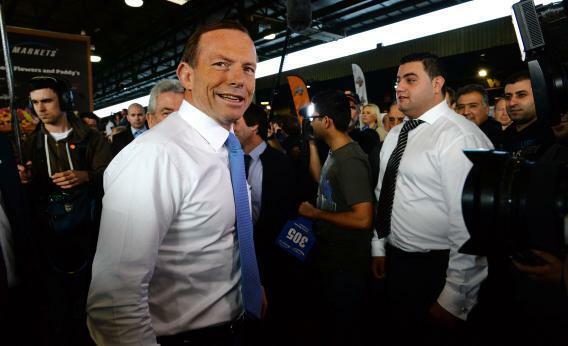 Australian election 2013: Will Tony Abbott defeat Kevin Rudd over a carbon tax? Will another prime minister be toppled on Saturday? Australian opposition leader Tony Abbott meets traders at Flemington Sydney market on Sept. 4, 2013. As you watched last year’s U.S. election, did you find yourself aggrieved by the lack of big climate change talk from your leaders? Well, I have an election you’re going to want to watch. This weekend, a nation gripped to the point of near-hysteria over carbon abatement policies (yes, there is such a country) will finally put to rest an epic struggle that has rolled on for years. Well, that’s the plan, anyway. Saturday’s national election, if we’re to believe the opposition’s rhetoric, will be a referendum on the future of the carbon tax that was introduced by the Labor Party that has been in power for the last six years. Tony Abbott, the head of the conservative opposition, is leading opinion polls. In the likely scenario he wins, he has promised to repeal the carbon-pricing legislation. Climate change is by no means the only issue in this campaign: immigration, leadership, and economic management have played big. But the election will nonetheless be the culmination of a long and heated national debate about climate change, one unlike any other in the world. In 2009, the conservative opposition party (called the Liberal Party) replaced its leader Malcolm Turnbull, who was a proponent of an emissions trading scheme, with Abbott, a man who is vehemently opposed to a market-based solution. The following year, Julia Gillard replaced sitting Labor Party leader Kevin Rudd, her boss, as prime minister, only to be challenged and defeated by a resurgent Rudd in 2013. The names and pace of change might be hard to follow, but the message is simple: Carbon pricing has cut to the quick of Aussie politics and become a symbol for deep ideological divides. Politicians enthusiastic about putting a price on carbon in other countries must be looking on in horror. When a carbon tax was finally introduced by the Gillard government in 2011, it faced immediate, vitriolic opposition from an invigorated conservative opposition party led by Abbott and a fear campaign run by talk radio around the country, which labeled the “toxic tax” as a broken promise. Before the 2010 election, Gillard had said she wouldn’t introduce a tax. In reality, the carbon tax was the fruit of an elaborate negotiation between Gillard, independents, and Greens to preserve her vulnerable coalition government. (The tax will eventually become a trading scheme.) The price she paid was fatal. The opposition has been ruthlessly committed to its mantra ever since: Dump this toxic tax. When this pitiless campaign sunk her polling numbers to subsurvival territory, her own party dumped her.